I renamed my very first brush engine, sumi-e, I wrote a long time ago. It was Google Summer Of Code 2008, the year I joined the Krita team. This brush engine started my joy over the brush engines. I have improved it lately. In hairy brush you don’t define the brush mask, but you define the bristles. Every bristle has a position and lenght. For setting up the bristles I used to use Guassian. I like this function for it’s naturalness, that’s why I used it. The value of the function defined the lenght of the bristle. But in turned out that it is not very effective. It produces masks you never had enough control over its dimension. You had to understand the sigma in Gaussian and not every artists care about math. So I decided to reuse the brush dialog that is shared among the other paintops and use pixel masks to define the bristles. Every pixel define the bristle. The intensity and alpha of the pixel define the lenght of the bristle. The position is computed according the center of the brush. What it gives? Many new possibilities for shapes of the hairy brush. You could have only round shapes before, now you can have any shape. If the pixel is transparent, the bristle is not in the brush – that is the trick to have any shape. Other bonus is that you can have colourful shape also, that was not possible before. You can control the hairs spacing in the brush shape by parameter scale. This parameter scales the position of the bristle from the center of the brush. Next parameter is random offset. The path of the bristle is randomly deformed according this parameter. You can setup the limit of the offset of the bristle from the initial position. So far the scale has been always controlled by the pressure. I made this optionally now by adding the size sensor and implement that support in hairy brush. So you can turn off the change of the size according pressure or you can control the size by different sensor like time or distance or tablet’s tilt. And now you can paint also grass more easily as enkithan reported to me. There were some performance problems also with sumi-e, now hairy brush. I benchmarked and fixed the related bug and I introduced also some feature that helps with performance. Usually the more bristles, the more slowdown. I added possibility to control the amount of the bristles. You can specify the percentage of the density of the brush. Quite useful when you need big brush. Related feature is also threshold according the pressure. Now when you paint, only the bristles which are able to touch the canvas, will be painted. Before I used opacity to control the used/unused bristles. Now it is more fun. 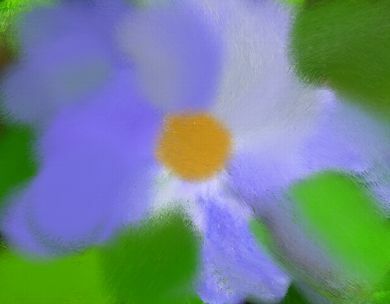 You can turn off the size sensor and use threshold to control the size of the brush stroke. Or you can combine as these features complement. I have some other ideas how to improve Hairy brush. Rotation has to be also controllable according the sensors.Ink depletion has to be reconsidered, more color effects has to be added. The bristles should be more anti-aliased. We will see. Feel free to contact me if you have anything related to hairy brush features. 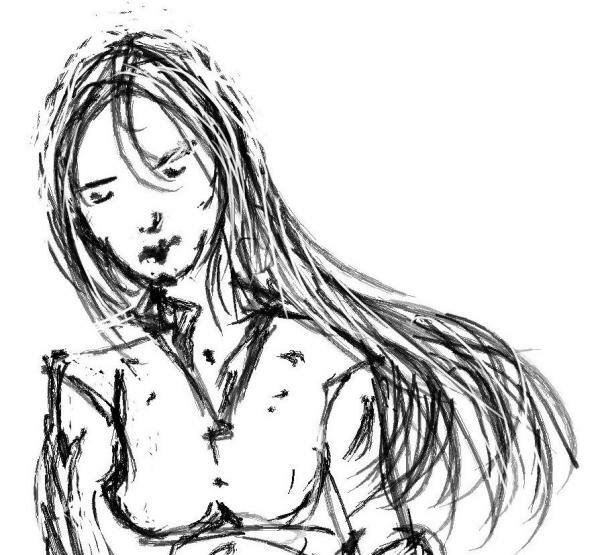 Here is the crop of the sketch that Boud, the Krita maintainer, did with hairy brush lately.I like especially the hairs and the eyes. By default it is off. Just for the historical reasons.